The PedalHaus Tours are, as the name suggests, bike rides combined with visits to sustainable building projects. These are run by AECB Local Groups for its members and guests. Whether you are a lycra-clad cycling enthusiast or occasionally hire a Boris Bike, you are welcome to come along and see different types of construction and meet AECB members who are experts in the field. The Yorkshire PedalHaus, originally planned to coincide with Passivhaus 2014 Open Days in November 2014, was postponed until the weather warms up in the Spring. Inspired, no doubt, by the the Yorkshire Tour de France Grand Départ, this event was organised by Green Building Store‘s Chayley Collis (needs no introduction) and Simon Owen (CIBSE Yorkshire Committee Member and Building Engineering Recruiter focused on M&E, Sustainability, BIM & FM). More details https://www.aecb.net/event/le-tour-huddersfield-yorkshire-pedalhaus-9th-november-2014/. This event has now been re-scheduled for Sunday 21st June 2015, please click here for the details. 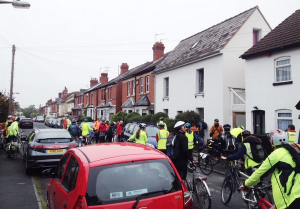 The Worcestershire PedalHaus, organised by Simon Jesson of the Local Group for Gloucestershire, Herefordshire & Worcestershire. Originally planned for 2014 ( www.aecb.net/event/worcestershire-pedalhaus-tour-13th-september/) this tour hopes to include visits to Haberley passivhaus and Cobtun. Simon, who travelled down to Kent for the PedalHaus in 2012, was so impressed with the tour that he has become an AECB member on the strength of it. In the pipeline . . . .
Wales could be the destination for PedalHausists in 2015. We spotted an ASBP director, Graham Hilton, on the Box Hill King of the Mountain ride in 2014 and have now got the some suggestions from his fellow director, Gary Newman, for a possible PedalHaus in Wales – possibly the Coed-y-Brenin Visitor Centre recently extended by Architype. Brighton. The Brighton Group have some ideas about their first PedalHaus and would be keen to hear from cyclists in the South East area. If you are an enthusiast of cycling and eco-architecture, please let us know by emailing the Local Group Coordinator, we shall add you to our mailing lists for Local Group events. We would also like to hear from you if you have interesting projects that could be visited by bike. Please note: The rides are on cycle tracks as well as public roads (some busy A roads) and participants must exercise sound, mature judgment, being responsible for their own and others’ safety. Cyclists are reminded to carry out manoeuvres safely and to adhere to the rules of the road.